Dave and I love having a big breakfast on Saturday mornings, and we often have some sort of breakfast food for dinner one night a week. These “perfect pancakes” are one of our favorite go-to breakfast foods because they are so easy, they only require a few simple ingredients, and we can mix and match any optional ingredients to fit our mood. I’ll often make a double or triple batch of these pancakes — putting blueberries in the ones we eat for breakfast, chocolate chips in the ones we eat for a snack, and leaving the ones we eat for dinner plain. 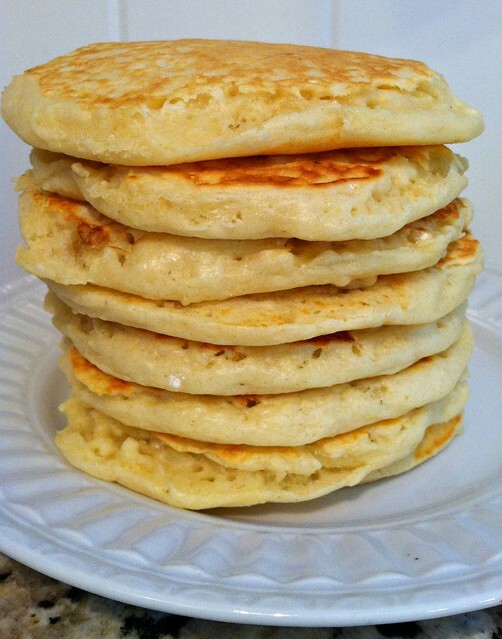 I have to confess though, when we first got married, I made pancakes from Bisquick mix. I figured that making them from “scratch” was just too much work… until I found this Perfect Pancake recipe. 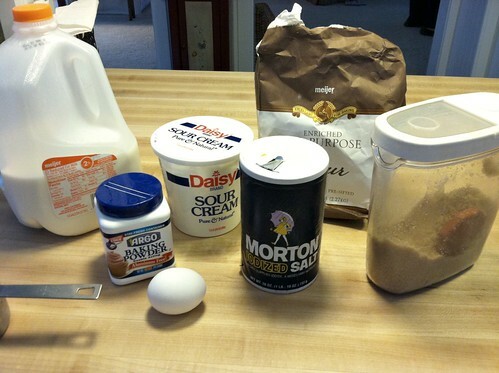 In a medium bowl, combine flour, brown sugar, baking powder, and salt. 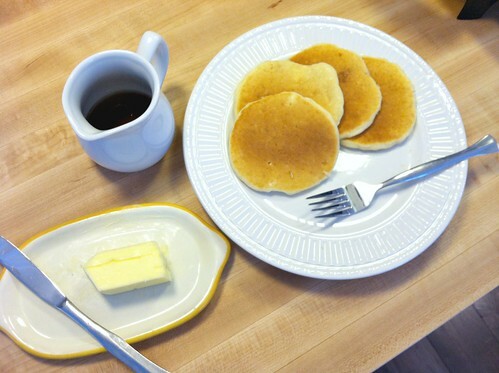 Pour or scoop the batter onto a preheated griddle or frying pan — I use a gravy spoon, and this griddle. If you want to add berries or chocolate chips, sprinkle them on top of the bubbling batter before you flip the pancakes. If you just like your pancakes plain, you may skip this step. 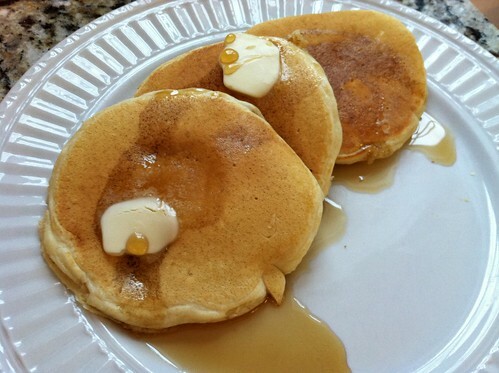 Once the tops of the pancakes are filled with “bubbles”, quickly flip them over to cook the other side. When the second side is golden brown, stack your pancakes on a big plate and drench with butter and your favorite syrup. This recipe makes about 15 small 4″ pancakes, but as I mentioned above, it is easily doubled or tripled — and as with almost all of my recipes, these pancakes freeze wonderfully! These are seriously the best pancakes ever… perfectly perfect pancakes in my opinion! This is one of the many recipes I know by heart. I’ve literally made hundreds and hundreds of these pancakes over the past 6 years — and I can only imagine how many more I’ll make in the years to come! What are your favorite breakfast recipes? Visit my virtual recipe box for more simple, delicious, family friendly, recipes! Made these for the first time this morning and my girls literally gobbled them up with Nutella or maple syrup. Super easy and quick. Thank you. My husb is the pancake maker but we only use Bisquick. I can’t wait to try your recipe this weekend and I might impress him with my pancake making ability yet. Haha! These look delicious and today is national pancake day! I’ve also substituted yogurt for the sour cream, but I personally don’t like the texture or taste of whole wheat flour so I don’t use that. I made these pancakes this morning and they were a hit! I’ve tried many pancake recipes over the years and my husband says he likes these ones the best. 🙂 Thanks for posting! yay — so glad you guys liked them! they are REALLY good and REALLY easy! yay — glad you liked the recipe! we eat it almost every Saturday morning (and usually put chocolate chips in as well). Good idea with the food coloring — I’m guessing Nora would love that idea! 1. In a mixing bowl sift together dry ingredients including flour, baking powder, baking soda, and salt. 2. In another bowl whisk together egg and buttermilk until become uniform foamy mixture. 3. Gradually add dry mixture to the egg mixture and make smooth batter. 4. Add melted butter and sugar and mix well. 5. 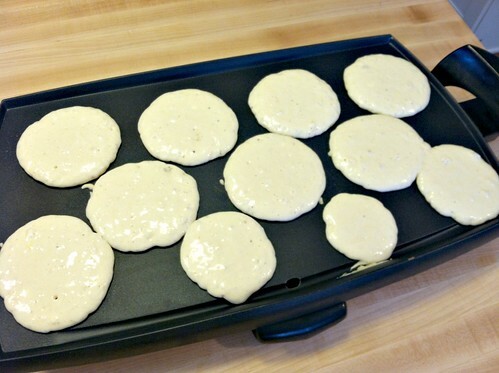 Heat griddle pan with little amount of oil (just grease the pan), using ladle pour ¼ cup of prepared batter into the center of heated griddle and cook on slow heat until become brown from the bottom side, then turn the pancake and cook other side until become brown. 6. Place the pancakes in the white serving platter, put a small cube of margarine in the center and drizzle some caramel sauce or honey on top of the pancakes. 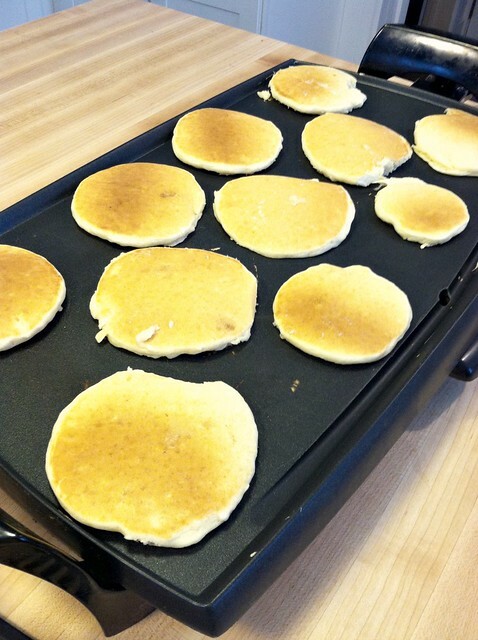 Delicious IHOP pancakes are ready to serve as breakfast meal. 7. To make recipes similar to this one and various other copycat recipes of top American restaurants, grab a copy of the cookbook America’s Secret Recipes (get 5 sample recipes) . Love your website. Just found it today through Pinterest. So helpful since we are just starting our family and in need of a plan and organization. Anyways…How do you freeze your pancakes? Do you just put them in a freezer bag? Do they get stuck together or do you put wax or parchment paper in between them? I’d put wax paper between them — or freezer them flat and then put the already frozen pancakes in a freezer bag! Yeah — he’s not that great with technology 🙂 I walked him through how to find it on my website though! amazing!! My whole family, 4 year old, 2 1/2 year old, and 10 month old, plus the hubby loved them! I will be making them again for sure. Thanks for the great recipe!! My family & I growing up always put peanut butter on our pancakes and covered in syrup. So I’ve now had my husband try that and he’s hooked. Try it if you haven’t its Yummy!! First homemade pancakes my 1 and 2 1/2 year old would eat…they love the frozen mini pancakes but wont usually touch anything else. This recipe is way different so I thought I’d give it a try. I added a splash of vanilla and topped them with peanut butter and a little syrup and they devoured them! These should be much cheaper (and healthier) than the store bought pancakes! I made these yesterday and they turned out very good. Mine seemed a lot fluffier than yours for some reason. Then when I sat down to eat them, I realized I never added the eggs- they were still sitting on the counter. lol I can’t believe I did that! Everyone ate them and didn’t even notice my little secret. Can’t wait to try these again using all the ingredients. Here’s the recipe I use. It turns out delicious. I think it’s even tastier than any I have purchased in the store. I follow the recipe as printed but usually double it and store it in two pint mason jars so I don’t have to make it as frequently. I have an old glass maple syrup bottle that I refill from the mason jars so it’s easier to pour without all the drips. I too make my pancakes from scratch. I use a recipe from my vita-mix cookbook and it takes seconds to blend in my blender and then to pour onto the hot griddle. When we moved last summer, I didn’t have much in the house in the way of food. I had ingredients for pancakes but hadn’t bought any syrup since moving to our new home. I made pancakes that morning and looked up a recipe for syrup online. It turned out so delicious and saved so well in a small mason jar that I no longer purchase syrup. I just make a double batch every few months and we’re good to go. If you haven’t made your own syrup, you should give it a try! Some of my favorite types of breakfast foods are: oven pancakes with blueberry sauce, french toast, homemade cinnamon rolls and coffee cake. Hmmm…guess I love carbs! Yum Megan — do you have a link to the syrup recipe you use? Can’t wait to try this recipe. When I make mine, I often add a small (rectangle) Gerber sweet potato baby food. It gives the pancakes a golden color, a nice aroma and some extra nutrition! MIX BROWN SUGAR, WATER, BUTTER AND SALT IN SAUCEPAN. HEAT TO A BOILING, STIRRING CONSTANTLY. REMOVE FROM HEAT. STIR IN THE MAPLE FLAVORING. SERVE WARM. AND I HAVE TO SAY I LOVE PANCAKES AND WAFFLES. ESPECIALLY WITH PEANUT BUTTER AND MAPLE SYRUP!!!!! This is the same recipe I’ve used for years, minus the sour cream. I put one extra T of baking powder for a fluffier pancake. My secret ingredient is a splash of vanilla. Awesome. Always on the lookout for an easy pancake mix. However, my husband refuses to eat (“allergic”) anything with sour cream. Do you have a suggestion on what I can substitute it with? Thanks. I’d just try it without the sour cream — I can’t imagine it would cause the pancakes not to turn out! You could use yogurt. I use Greek yogurt in place of sour cream all the time. Is it 1:1 yogurt to sour cream? I freeze my pancakes, too, making my Uncle Arno’s recipe…but I’ll have to give this one a try. This winter, I’m eating a lot of baked oatmeal (which I freeze in individual muffin cup sizes) and being from Texas, I like my breakfast tacos! 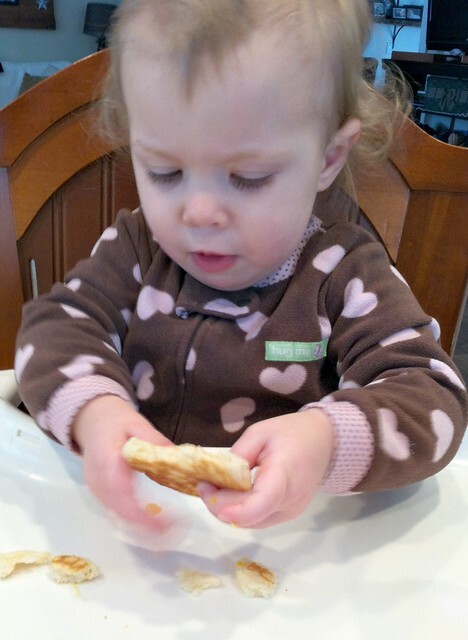 Mmmm – I love pancakes, especially for dinner. I used to make all mine from a Bisquick mix too. Mainly because it was convenient and I always had coupons. But I’ve been mix free for about 6 months now, and I don’t miss it at all. Yikes – that sounds like I had an addiction, lol! I’m from the South. We like to put pecans in our pancakes. With plain pancakes, we use peanut butter and syrup, which adds some protein. Maria, We also put peanut butter on our pancakes. We have converted many people to do the same. Once they try it, they love it! Ay yi yi! I am so hungry now! And missing gluten. Not as much for the pancakes as for the biscuits and gravy the other commenter mentioned. YUM! Breakfast food is so delicious. Your pancakes sound fabulous. Forgot to add that we also love pancakes and they MUST have ground cinnamon in the batter. It is my secret ingredient I have been using since highschool, it makes the pancakes so good! & More. Can you tell we enjoy breakfast? Lol… Hope you have a wonderful day! They look yummy. I love the new Clean print feature. GREAT idea telling you how many pages will print, love that. So I cut it down to print 1 page. My husband is the pancake maker so I’ll pass this on to him! Don't miss any of my tips, ideas, recipes, or cute kiddo pictures. Subscribe via RSS Feed or via email! Freezable Foods — yup, you can freeze all of this! My Daily Routine + Free Printables! My Daily Planner: The NEW Customizable Version! © 2007-2019 Farmhouse Media, LLC & AndreaDekker.com. All rights reserved.